Three Paper Piecing Patterns 20 x 20 cm. 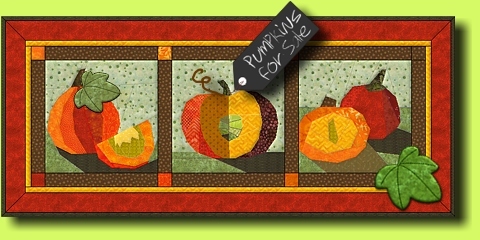 These pumpkins color your wall, table or shopping tote! For a wall hanging you may arrange the blocks either horizontal or vertical. The pattern includes instructions for the three dimensional leaf and curly tendril. What about combining the pumpkins with a Cheeky Raven?